1 of 1 Whisk canola oil, vinegar, mustard, ketchup, garlic and Italian seasoning in a medium bowl. Combine with steak in a large resealable plastic bag; shake to coat steak. Refrigerate for 4 hours or overnight. 1 of 3 Heat oven to 450 degrees F. Toss potato wedges with the canola oil, Italian seasoning, salt and pepper. Place on a baking sheet; bake at 450 degrees F for 30 to 35 minutes, turning once. 2 of 3 Heat broiler or stovetop grill pan; lightly grease. Season steak with salt and pepper. Broil or grill steak 3 minutes per side or until internal temperature reaches 125 degrees F for medium-rare. Let stand 5 minutes; thinly slice against grain. 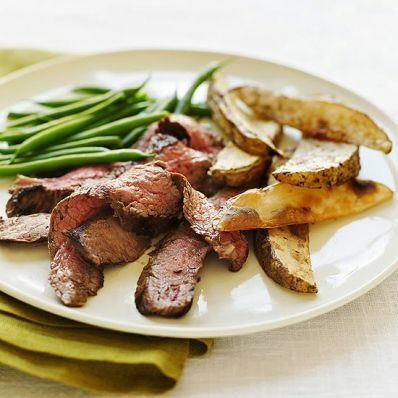 For each lunch, set aside one serving of steak. 3 of 3 Toss fries with basil oil and serve with steak.